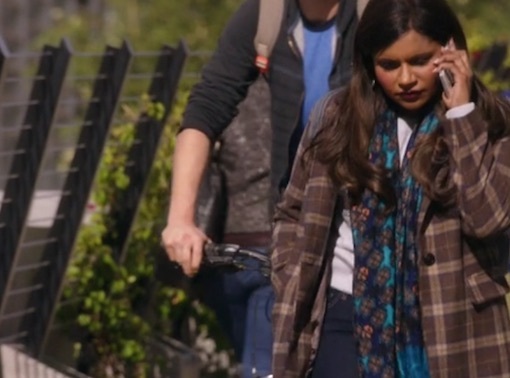 Mindy Kaling, if you’re reading this, I love you and I love your show, The Mindy Project. Please take me shopping with you and/or be my best friend. P.S. – I love you. Mindy’s outfit is perfect for a dinner date or going out with friends, but it’s also casual enough for everyday wear, which is my kind of outfit – I’m far too lazy to change into more glamorous evening outfits. To recreate the look, start with a a floral body-con dress. I’ve always been nervous about wearing these, but Mindy rocks them with inspiring confidence, and I’m ready to give it a try. Add a cute faux leather jacket and a purse in a hue that matches the floral print. Mindy loves matching accessories, and it’s a great way to dress up an outfit without making it look too busy. She also loves bright colors, so grab green flats for a fun pop of color. Put on a cute pair of chandelier earrings and a thick bangle, and to really channel Mindy, add a pair of cute thick-rimmed glasses. I have waxed poetic about the fun comedy,New Girl, many times (see here and here for more recaps! ), so I won’t bore you with my typical gushing about Zooey Deschanel and her amazing style/hair/everything. I especially loved this cruise-themed episode, though – mostly because it got me so excited for summer! The closest I usually get to a beach is walking past a puddle underneath my apartment’s broken gutter, but I’m still in total beach bunny mode. I’m obsessed with straw hats and colorful prints for summer, and I’m spending an absurd amount of time looking online at swimsuits that I don’t really need. When I saw Cece’s laid-back and adorable cruise-ready look, I fell in love. I can just picture myself wearing this and walking around barefoot by the ocean with a margarita in hand. I’ll probably just end up wearing this on a picnic or out to lunch, but a girl can dream, right? To recreate this ensemble, start with a loose-fitting, colorfully printed tunic dress. Add leather sandals and a cute straw hat to channel Cece’s effortlessly stylish vibe. Grab a beach tote, or for an everyday look, carry a structured white bag. Accessorize with an ornate bangle, then paint on a few coats of a vibrant neon nail polish. To complete this beach-ready getup, add some sea salt spray to your hair to create beachy waves or put your hair in a side braid like Cece did!